within the confines of the law. The BSR System is the safest and most efficient form of self-defence that works within the confines of the law. This system was designed for the smaller, weaker, non-athletic person in a confrontation with a bigger, stronger aggressive attacker. This system works and we can prove it in class and under the pressure of a resisting opponent. Simplifying the art of Self Protection. This program is for men, women and children of all ages and we prove that what we teach works and can be learned in a short period of time by anyone. What is The B.S.R. System? The B.S.R. System stands for The Browne Street Ready System which was created for people with low attribute development and / or for people with injuries that inhibit proper body movements. This system is a step by step approach to dealing with aggression in an intelligent, safe, efficient and effective manner and within the confines of the law which makes this system morally acceptable in society. This system deals with fear management and how to deal with violence while being the smaller, weaker and less athletic person in the confrontation and how to accomplish this goal within the confines of the law. This system was created under the conditions of defending yourself against a bigger, stronger, aggressive and more athletic opponent. The system is based on controlling an aggressor’s ability to harm you. Why? Because when you are attacked you are surprised, off balance and usually the smaller, weaker person in the conflict and 80% of the time you will not be able to just get a bigger person off you until they make a mistake or give you an opportunity to escape. 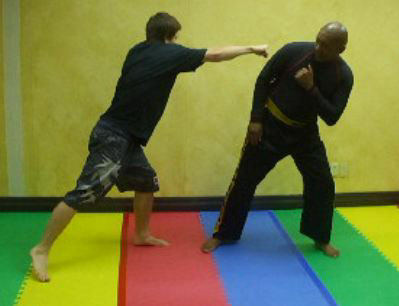 Therefore, this system teaches and trains clients and students exactly what a smaller, non-athletic person needs to do to survive an aggressive attack and how to accomplish that goal within the confines of the law. The B.S.R. System is a self-defense performance based program in which a smaller, weaker person can survive and escape against a bigger, stronger aggressive opponent and accomplish this within the confines of the law and we will prove it against a resisting opponent. The system's emphasis is keeping you safe, the fundamentals and to simplify the art of self-protection. The system is a training method that will let you know your true ability and not some false assumptions of grandeur. With this style of training as our base it can be translated to any form of self-protection or sport, since this is a performance based system. If it does not work under pressure in class, why do it in a life threatening situation. We aim to simplify, not complicate and we teach by doing and not in theory. The core framework for this system is based on low attributes, so that even with injuries and poor conditioning you can be effective at self-defense. By having an understanding of the system's concepts and positions you will develop the ability to survive while you are afraid until you have the confidence to defend yourself effectively while under stress. The system is based on taking Opportunities in Movement with Rules, rules are made to be broken only by a better opportunity in movement or by your superior attributes in the moment, but the system is the positions with the rules. The Positions are starting points that we head for in order to deal with an opponent’s strikes and grappling attacks but remember all positions have strengths and weaknesses. The positions we choose to start from will give you the most Leverage, Mobility and Safety and remember the system's main objective is for a smaller person to survive against a bigger opponent. The Rules are concepts for transition. Rules help you to know what to do next and why, so that if your technique or concept fails, you will know why. The system's rules are based on it's core framework of you being smaller and weaker than your opponent and therefore mobility and options are always necessary. Remember size and strength are attributes and attributes do matter in a confrontation. So, train as though you have low attributes so when you have the superior attributes it's even easier to win.